A first class candidate to CDM credits for India, the hydro scheme developed with Norwegian funds, WB and IFC causes opposition for disrupting local economies and water sources. But with little displacement, thus no compensation measures at sight. Allain Duhangan Hydroelectric Project (ADHP) was proposed by AD Hydro Power Ltd. (ADPL); it is a run-of-the-river 192 MW hydro power project at the confluence of Allain & Duhangan rivulets at Prini village (closed to Manali and Jagatsukh towns) of Kullu district in Himachal Pradesh state of India. The area is very well known for prosperous agriculture (especially apple orchards) and touristic attractions, including trekking and skying facilities. The proposed project harness hydro energy from a combination of glacial snow melt and monsoon rains in the two rivulets and supply it to various consumers through Northern Regional Grid (NR grid). This project also includes the construction of a 175 km high voltage line for transmission of power to the national grid connection point located at Nalagarh in Himachal Pradesh. Its construction started in April 2010 and was inaugurated in 2012. With support from the World Bank Group, the Norwegian government, private investors built the plant. According to the Norwegian company, "Through generation of renewable energy, Allain Duhangan will replace some of India`s thermal power production and the UN confirms the project will reduce global CO2 emissions by an estimated 495 000 tonnes annually. " . The project was also taken up under the United Nations Framework Convention on Climate Change (UNFCCC). At that time, it was the largest among all the hydropower projects from all over the world registered to get credits under CDM. It is also slated to get the largest number of credits, at around 4.94 million CERs (Certified Emission Reduction credits). This was in spite of the fact that there is evidences that it had been conceived far before applying to CDM and had been even given a first financial clearance. It is therefore hard to prove that it responds to the additionally CDM criteria. The South Asian Network on Dams, Rivers and People (SANDRP) also notes that it is "interesting to know that ADP is India’s first merchant hydropower project. This means that the project developer will not have any power purchase agreement with any electricity board or distribution company. It would rather sell the project based on short term contracts based on spot market prices. What this implies is that the project developer found the project so economically viable that he decided to forgo the relative safety of PPA and was ready to take up the risk of merchant sale. 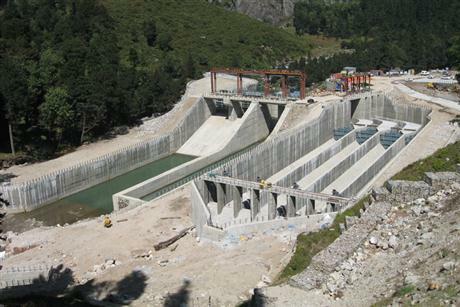 The project was thus more viable than most other hydropower projects that require PPA. This should again be a factor in disqualifying the project from consideration of CDM credits". The network thus considers that this is a $75 Million fraud, as this is the sum it would get at the time of CDM application from CERs . The Certified Emission Reductions will be sold to the Italian Carbon Fund for which the World Bank is the Trustee. The project has caused many protests and mobilizations in the region. The project is in fact located on village lands, affecting the local population and their means of livelihood as it will divert the creeks on which the farmers have so far depended for their livelihoods. It will also affect apple fields and tourism related activities. Local people have filed numerous complain letters, such as to the President of the World Bank and the Ombudsman of the IFC, which is also financing the project. In this last letter, they state: "The project is likely to dry up the Duhangan river, which is a lifeline for Jagatsukh village as the whole village (as some others) depend on the river for our drinking water, for our irrigation water and the river has great cultural and religious significance for the village. Our concerns on this issue have not been satisfactorily addressed by the company, the consultants for the ESIA or the IFC in spite of repeated reminders about these concerns" [6, 7, 8] Ironically enough, since not all the villagers will be physically displaced, they are falling through the cracks of the World Bank’s safeguard policies and are not entitled to compensation measures. Also, the dam has brought 2,000 foreign workers into the region, along with illegal logging and serious accidents in the town of Jagatsukh. The project requires a portion of the Allain and Duhangan rivers to be diverted through tunnels to an underground power house to two 96MW generating units. A small diversion structure on the Allain River will supply water to an off-stream storage reservoir. That, together with water storage in both tunnels, will provide capacity for four hours of peaking generation during dry periods. Power is transmitted to an existing substation at Nalagarh through a 180km-long and 220KV transmission line, from where it is transmitted to Rajasthan by a power grid. The transmission line has two sections, the snow zone from Prini to Panarsa and the non-snow zone from Panarsa to Nalagarh. About 15% of the electricity is being provided to Himachal Pradesh State Electricity Board (HPSEB) free of cost for the first 12 years, after which the supply will be increased to 20%. Bhilwara Energy Limited from India - The Allain Duhangan Hydro Project Limited (ADHPL) is a subsidiary of Malana Power Company Limited, a joint venture between Bhilwara Energy Limited and Norway’s SN Power. Malana Power Company Limited from India - The Allain Duhangan Hydro Project Limited (ADHPL) is a subsidiary of Malana Power Company Limited, a joint venture between Bhilwara Energy Limited and Norway’s SN Power. Rajasthan Spinning & Weaving Mills Limited from India - Allain Duhangan Power Company Limited (ADPCL) is jointly owned by Rajasthan Spinning & Weaving Mills Limited (RSWM), HEG Limited (HEG) and Malana Power Company Limited (MPCL). Development of Alternatives SANDRP, together with many other EJOs, advocates for a comprehensive review of hydropower plans in the Himalayas, arguing the current programs by the state are not sustainable and might lead to more disasters as the one witnessed in June 2013 . Why? Explain briefly. Despite all criticism regarding the impacts and the CDM related uncertainties, the plant has been constructed and is currently operating.